I ran into a dilemma as I considered including photos of myself on this blog. You see, I almost NEVER look good when I garden. In this picture, I hadn’t showered for two days. Why shower and put on cute clothes when you’re about to go spread manure around? Typically, I wear a bandana to keep my hair back (hence my icon girl), but today was really sunny and a bit cold. So I swapped my normal head-wear for this ski cap. I didn’t purposely mix a purple shirt, grey pants with an orange stripe, and green gloves–that kind of fashion is just a gift! 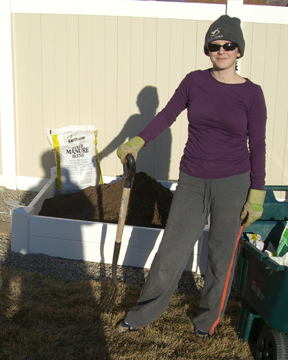 Another ugly part of gardening–compost. Today I went to Wal-Mart to buy some for my gardens. I bought 9 bags of steer manure compost, and 3 bags of chicken manure compost. It cost about $20. I don’t think I’ll need to spend any more (cheers are heard in the background). I tilled the beds with my pitchfork, revealing a HUGE colony of earthworms. I can’t explain it, since the entire strip of ground under my gardens is covered in weed mat. But earthworms I have–my son was in heaven playing with “wormie,” who is apparently his new best friend. Tomorrow I will plant my peas. I can’t wait! Happy gardening! Thanks for making it real and letting us all in on your gardening duds! You just gotta love gardening!!!! I have lots of pictures of my beds on the site, but I haven’t figured out a way to organize that stuff yet. Perhaps I’ll add a page of photos. Watch for a new tab in the next day or so! I would love to see a picture of all your planter beds. This would be very helpful. We are building some more. Were your beds expensive to put together? I took you advise and planted peas on Saturday. It was mostly to keep the kids happy, but I was pretty excited too. While I was in IFA today I stumbled upon some onion sets. I have never used these before so I snagged an associate to get the low down. She recommend planting them right now. I was curious if that was true? Also what do you do with the left over sets? I don’t plan on plating all 100 hundred bulbs. Can I keep them in a cool dark place until next year or are these a one time use only? I love that you’re not afraid to admid it had been two days since you showered–it happens to us all!!! What’s the difference between the 2 different composts that you bought? Also, 12 bags for $20 seems like a great price!